At Inductive Automation's training center different people from various industries come from around the world to receive expert training in Ignition. One such individual is Brett Yeomans. He recently made the trip from the United Kingdom to visit the Inductive Automation training facility in Folsom, California. Brett works for the Weetabix Food Company, one of the largest producers of breakfast cereals in the world. He has been with the company for 20 years and is currently working there as a software engineer. One of Brett's passions is exploring and experimenting with new technology. "One of the best parts about my job is the chance to find and play with the latest software, so I was excited to work with Ignition," Brett said. After many years of using an older SCADA package, Weetabix is looking to upgrade to Ignition. Brett explained the need for the switch: "Our current SCADA is so basic, it really just logs tag information to a local machine and someone has to be at that machine to retrieve it." Brett continued, "With Ignition all the information is stored in a central location and it can be accessed through a web browser. This will make it easy for people on the factory floor to access information – everything will be much more connected." In preparation for the transition, Weetabix asked Brett to visit Inductive Automation's training center in order to get more familiar with Ignition. One-on-one education is one of the benefits of the Ignition training courses. 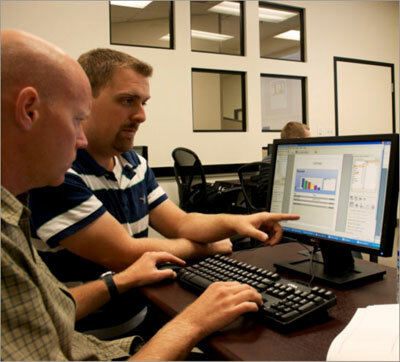 Brett Yeomans (left) receives expert instruction from Inductive Automation’s Director of Training and Support Services, Travis Cox (right). Inductive Automation offers several different training courses; the most popular are the 5-day Ignition core course and the 3-day advanced course. Brett visited the training center to attend both: "The 5-day training course was very good and easy to follow; I learned a lot but didn't feel overwhelmed. The advanced course was much more in-depth and the pace was much quicker; we covered a lot of ground." Like many people new to Ignition, Brett had downloaded and experimented with the trial version of the software. After teaching himself for around a year or so, he attended the training courses. "If anything, I wished I'd come much sooner. The amount of material we covered in a few days would have taken me months to learn on my own." Brett continued, "The quality of instruction, and the ability to get instant answers to my questions, has been great. Now I've learned the best way to do things in Ignition and that will make a big difference moving forward." Brett learned a lot in his time at the training center, but a few of his bigger takeaways stand out. "We learned about a way of creating paperless forms that I think will come in very handy and save the company a lot of time and money,” Brett said. “But the biggest thing I'm leaving here with is confidence. I came to bolster the company's confidence in rolling out Ignition on a larger scale, and after the training I'm very confident that Ignition will work for us. I feel much more certain in my skill level with it now." Teaching Brett and people like him about Ignition is what we here at Inductive Automation love to do. One of our greatest joys is to show our customer just how much they can do with Ignition and how much easier it can make their jobs. So come out to the Inductive Automation training center, we are ready to help.